In the poster on the left, the first sketch (top-left) represents “perfect” head posture. A line dropped from the center of the external auditory meatus (EAM) would land directly in the center of the shoulder (the tip of the acromion process). 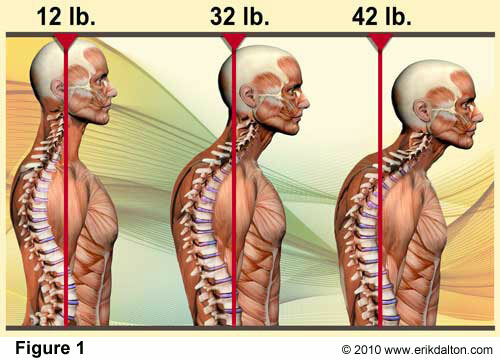 The graphic on the right demonstrates the progression of forward head posture (occasionally referred to as “anterior head translation”). According to Kapandji (Physiology of the Joints, Volume III), for every inch your head moves forwards, it gains 10 pounds in weight, as far as the muscles in your upper back and neck are concerned, because they have to work that much harder to keep the head (chin) from dropping onto your chest. This also forces the suboccipital muscles (they raise the chin) to remain in constant contraction, putting pressure on the 3 Suboccipital nerves. This nerve compression may cause headaches at the base of the skull. Pressure on the suboccipital nerves can also mimic sinus (frontal) headaches. 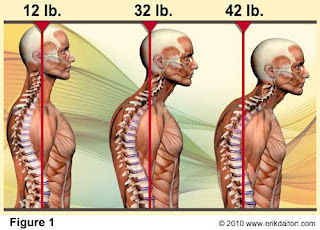 Persistent forward head posture (a.k.a “hyperkyphotic posture”) puts compressive loads upon the upper thoracic vertebra, and is also associated with the development of Upper Thoracic Hump, which can devolve into Dowager Hump when the vertebra develop compression fractures (anterior wedging). A recent study found this hyperkyphotic posture was associated with a 1.44 greater rate of mortality. It's not uncommon to observe 2" of anterior head placement in new patients. Would you be surprised that your neck and shoulders hurt if you had a 20-pound watermelon hanging around your neck? That's what forward head posture can do to you. Left uncorrected, FHP will continue to decline. Chiropractic can be very corrective, especially in the hands of a chiropractic rehabilitationist. Our specialty is in reversing the joint fixations (what we refer to as “subluxations”) and in re-invigorating the muscles that normally retract the head.